The exciting top news turned out as a surprise! Just two weeks after the 2012 Polish National Show and Auction where HH Sheikh Ammar Bin Humaid Al Nuaimi, proud owner of Ajman Stud, secured the lovely EJRENE and bought her in the 2012 auction for a record price, he added another Polish top world class mare to his collection - the outstanding EMANDORIA! 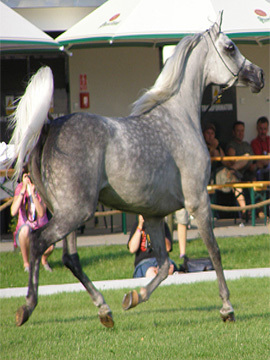 EMANDORIA is another Gazal Al Shaqab daughter (as EJRENE is, too) and out of the famous E-line, and bred by Michalow Stud. EMANDORIA will move now for a specific period in time into the stables next to the other Polish mares of Sheikh Ammar's Polish collection, which include the double World Champion Mare KWESTURA, International Champion Mare EMIRA, the recently aquired International and European Champion EJRENE, and now also EMANDORIA! The mating of two World Champions very rarely guarantees success. In the case of GAZAL AL SHAQAB and EMANDA, the cross was an unqualified success, resulting in EMANDORIA, an individual superior in all ways to her extraordinary parents. Along with the incomparable MARWAN AL SHAQAB and PIANISSIMA, EMANDORIA belongs to an elite collection of GAZAL AL SHAQAB get who have been both World Champion at the Salon du Cheval as well as United States National Champion. Inheriting her sire’s extreme type and quality, highly placed, elegantly shaped neck, balance, substance and strength of coupling, and confident charisma, EMANDORIA exemplifies the best of her paternal Egyptian-Polish cross heritage. She is the improved version of her beloved dam EMANDA, the look-alike daughter of the legendary EMANACJA – show horse and broodmatron supreme. The best of the EMANACJA qualities are clearly present in the magnificent phenotype of EMANDORIA, especially her extreme length and shape of neck, her depth and capacity of body, her impressive size and scope, her exquisite, dished face and her overall femininity and regal presence. EMANDORIA is indeed Arabian royalty. In the first four generations of her pedigree alone, many of the greatest breeding and show horses of the past quarter century can be found. US National Champion KAJORA, Egyptian Event Supreme Champion ANAZA EL FARID, World Champions KABORR, ETRURIA & EMANDA, Polish National Champions EUKALIPTUS, ECAHO & PEPTON, and legendary sires RUMINAJA ALI, SHAIKH AL BADI, ANSATA IBN HALIMA, PALAS, NABORR and BANDOS all make EMANDORIA the ideal Polish-Egyptian “Golden Cross” mare. Even more impressively, EMANDORIA is perhaps the best member of her illustrious dam family. As one might guess, EMANDORIA is a member of Michalow’s world renowned “E” family of mares tracing to foundation mare Milordka. 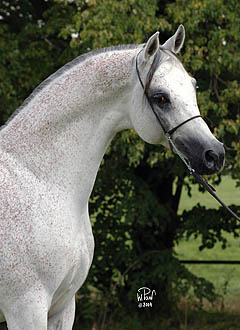 EMANDORIA represents the eight successive generation of champions beginning with Oaks & Criterium winner ESTOKADA (Amurath Sahib x Saga by Hardy), Polish National Reserve Champion ESKAPADA (by Naborr), US National Top Ten ESPADA (by Aquinor), Polish National Champion EMISJA (by Carycyn) and Polish National Reserve Champion EMIGRACJA (by Palas). EMIGRACJA became a living legend in her long career at stud, producing several outstanding daughters, the best by EUKALIPTUS and MONOGRAMM. 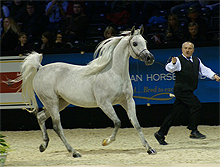 Three full sisters went on to become superstar show mares as well as stellar producers: Polish National and European Champion EMIGRANTKA – dam of Polish National, US National, All Nations Cup & European Champion EL DORADA, US National, Canadian National & Scottsdale Champion EL MUNDO, and Polish National Champion, European Champion and All Nations Cup Reserve Champion EMIGRANT; Polish National Reserve Champion and Babolna International Best in Show Champion ERLANDA – dam of Scottsdale Champion & US Reserve National Champion ELANDRA; and Polish National Best in Show, European Champion, All Nations Cup Champion & World Reserve Champion EMANACJA – dam of Polish National, British National and European Champion EMILDA, US National, Canadian National & Scottsdale Champion EMANOR, and Polish National Reserve Champion ESPADRILLA, as well as World Champion EMANDA – the dam of EMANDORIA. The lovely 2004 born EJRENE was the 'Top Seller' of the 2012 auction in Poland. In a dramatic auction the bay Michalow bred Gazal Al Shaqab daughter out of the Monogramm daughter Emocja was sold for 440.000 EUR finally to HH Sheikh Ammar Bin Humaid Al Nuaimi and his famous Ajman Stud in the United Arab Emirates. Sheikh Ammar has now added another most successful top quality mare from Poland to his beautiful first class collection. 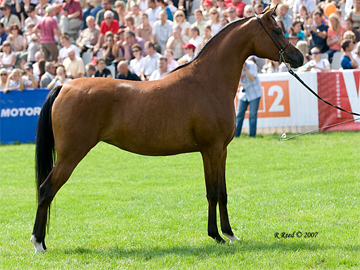 EJRENE is sold bred to the 2011 Aachen Gold Champion Colt and World Reserve Shanghai EA for a 2013 foal. The famous Michalow bred and owned mare EL DORADA, a 1998 daughter of Sanadik el Shaklan out of Emigrantka, has been leased to the famous Athbah Stud from Saudi Arabia. 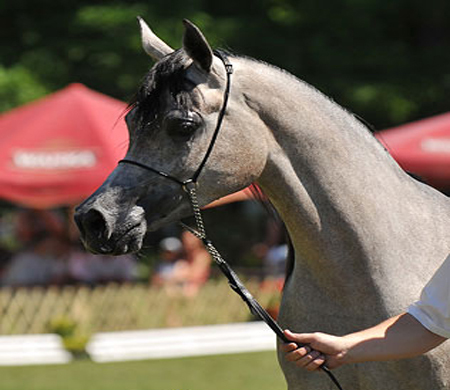 The 14-year-old Polish mare has achieved many successes, in Europe and also during her stay and time in the United States. The last time she was shown by Polish Michalow Stud was at the 2011 Paris World Championships, where EL DORADA finished in "Top Ten" and impressed all with her fantastic presence, look and outstanding movement. Athbah Stud moved her recently from Poland to Belgium where she will be based at the Schoukens Training Center, from where we can expect to see her to compete soon under the Saudi colours and flag. 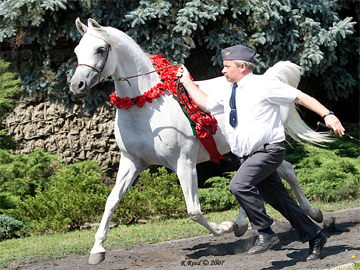 The 2012 'Pride of Poland' auction offers two great options of Gazal Al Shaqab daughters being in the top of the 2012 auction list, one from each of the famous Polish studs. One is the 8-year-old bay EJRENE out of Emocja (by Monogramm) bred and owned by Michalow Stud who is known already for many years as a consistently successful mare in the showring. She is also best known for the beautiful type, the well conformed head, her most exciting movement, and she proves her overall quality with all her show records and championships from early age to now. Her last success was at the 2012 Polish Nationals winning Reserve Champion Mare. In 2009, EJRENE gave birth to a filly by Eden C, in 2010 a filly by Ganges, and at the end of January 2012 she had a filly foal by Albedo (by Piaff). The other Gazal daughter offered in the auction is the 9-year-old grey ETNOLOGIA (out of Etalanta/ by Europejczyk) from Janow Podlaski Sud. This mare is best known from the international show ring and records several success, including overall Top Five Mare at the Polish Nationals and Top Ten at the Paris World Championships. She impresses with her overall balance, quality, size, and again, great movement.. The Auction itself is during the weekend of 10. - 12. August, and will be one of the most interesting events to visit and to follow up. The 'Junior Males' competition at the 2011 World Championships between the two three-year-old colts KAHIL AL SHAQAB and SHANGHAI E.A. was exciting - whoever attended the show will remember the great atmosphere and challenge that went on for two days. At the end, these two won Gold and Silver. Already in Paris, Janow Podlaski stud's director, Dr. Marek Trela, shared KAHIL's championship ceremony with the Al Shaqab team, as it has been published and already known before that KAHIL AL SHAQAB (Marwan Al Shaqab x OFW Mishaahl) will be on lease to Janow Podlaski for the 2012 and 2013 breeding seasons. However, Michalow Stud had also negotiated on the other Paris medal winner SHANGHAI E.A. (WH Justice x Salymah, by Khidar) who had been the 2011 European GOLD Champion Colt as well as GOLD at the 2011 Aachen All Nations Cup, where he was beating KAHIL to second in class. SHANGHAI E.A. has been chosen by Michalow Stud's director Jerzy Bialobok to breed some of the best and a bigger group of broodmares in 2012. That the Polish stud's have always been progressors in their programs. Now they have made another interesting new step taking both World Champion medal winners and the two big contenders in 'Colts' of the major 2011 show rings to Poland, each stud focussing on one. We will see the results of these two young stallions in the Polish programs the next two years, seeing their foals coming and growing on Polish ground. While KAHIL has just arrived in Janow Podlaski Stud, his two year younger full brother WADEE AL SHAQAB started his amazing show career. 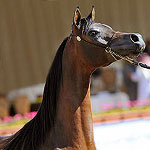 In December 2011 he won the title Qatar National Champion Colt, and continued January 2012 as the International SILVER Champion at the prestigeous Al Khalediah A-Show, and just one day ago he was crowned as the 2012 Qatar International A-Show GOLD Champion Colt. It seems that WADEE follows his older full brother KAHIL in the showring and carries on the success of this family. The famous QR MARC (Marwan Al Shaqab x Swete Dreams), 2011 World Silver Champion, multiple International Champion and outstanding young sire, has been leased by his owners Knocke Arabians in Belgium to Dubai Arabian Horse Stud. He will be breeding mares there, but he will also be shown and compete for Dubai Stud in the Middle East and through the show season. At his first appearance this year at the recent Abu Dhabi International Show in February, QR MARC did not just give a great presentation, he looked and showed maybe even better than ever before. From the six judges in the senior stallions' class he collected the ultimate score of 20 throughout the panel for 'Type', also five times a 20 for 'Head-Neck" and besides the other 19s and 19,5 in ' Movement' another 20 in this criteria. 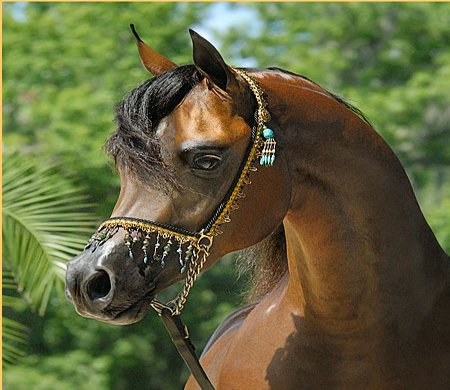 At the end, he was the sovereign 2012 Abu Dhabi GOLD Champion Stallion, voted unanimously from all eight judges. Next major stage and show for QR MARC is the ECAHO 'Title" Show in Dubai in March. The two-year-old QR Marc daughter PIACENZA (out of the Primawera, by Emigrant) is the new unveiled surprise and special addition to the already published list of the 'Pride of Poland' auction 2011 held pn 5 - 7 August in Janow. PIACENZA was shown throughout last year at the Polish Nationals as well as at international shows, always succeeding in excellent judging and placed in the top rankings, including the Bronze medal at the 2010 Polish Nationals, overall 'Top Five' at the 2010 European Championships in Moorsele, and 'Top Ten' at the 2010 World Championships in Paris in December. CHAMPIONNAT du Monde PARIS 2011. Polish Junior "SPRING SHOW " Bialka Stud Poland . Nous lui souhaitons de reposer en paix au paradis des chevaux ..
Every year, the Polish stud farms nominate a group of horses for the annual ‘Pride of Poland’ auction that is held at Janow Podlaski at the beginning of August each year and it is combined with the Polish National Show and a stud farm tour to the famous Polish stud farms of Janow Podlaski, Bialka Stud, and Michalow Stud. 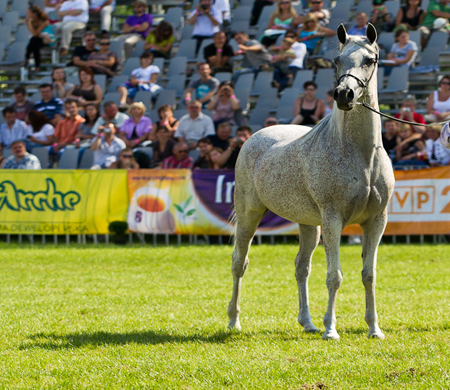 In 2010, the Pride of Poland auction offered lots of 36 horses, mostly show and breeding horse of different ages. The event regularly attracts people and buyers from all over the world, but the worldwide economical situation also seems to be reflected a little in the auction as there were not so many buyers there as in previous years. Overall the Polish studs were happy about the result of the sale, even though the record price was much lower than the last few years. 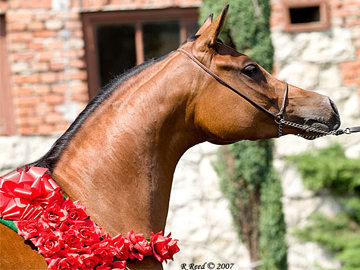 The 2010 record seller was the 14-year-old, flea-bitten mare PILAR, a Fawor daughter out of the famous Banat daughter Pipi. PILAR was Polish National Champion Filly in 1997, is a great quality mare, a fantastic mover, with a long and elegant neck, and has proved being a fantastic broodmare. 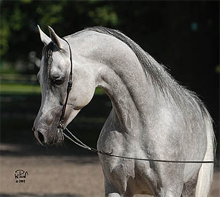 Until now, she has produced eight fillies and two colts, among them the two well known and most successful Gazal Al Shaqab daughters, Pieta and Pinga, and the 2009 auction record seller, Pinta, who sold last year for 500.000 Euro to Halsdon Arabians, Great Britain. So it was more than an excellent and outstanding chance to buy her dam PILAR now, and even for a very nice price of 240.000 Euro 'only'. 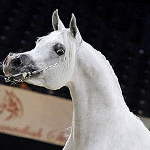 The buyers came from Qatar, a three-headed team of responsibles of the famous Al Shaqab. "We really hoped that we can get her, she is a magnificent mare and will contribute her qualities and Polish lines to our breeding programme," the manager and head of the Al Shaqab Breeding and Show section. Mohamed M. Al Sulaiti says. "Eventually, we expected her to go much higher in price, so we are really lucky, but also grateful to the Polish studs that we can have now this prestigious mare back home in Qatar and with us at Al Shaqab to breed her to our stallions." Félicitations au haras de Michalów qui a remporté le prix du meilleur éleveur du Championnat du Monde, prix qui couronne les brillants résultats de leurs représentants. La championne d'Europe EMANDORIA n'a pas réussit à répéter son exploit de Moorsele et a dû se contenter de la médaille d'argent, mais la plupart des autres participants polonais ont remporté un titre de Top 10.
vendue à "Pride of Po­land 2007 " au Haras "JOSEPH ARABIANS Mr Joseph Geenen (FR) vient de remporter le championnat et nommée :" Se­nior Gold Cham­pi­onne Mare". Félicitations à son nouveau propriétaire . 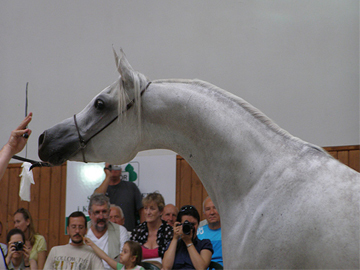 CELTIS (HS Etiquette x Celta par Pasat) , étalon alezan, né en 2006 à Janow Podlaski, vainqueur de la course. EQUILIN (Sarencen x Eqvida par Wojslaw) termine à la seconde place. Les résultats des championnats d'Europe sont terminés hier à Moorsele .Les chevaux polonais ont une nouvelle fois obtenu de brillants résultats avec la victoire du titre sénior par EMANDORIA, la médaille de bronze par le champion de Pologne EMPIRE et de nombreux titres TOP 5. ... Polonaise Legacy ...- Réserve de classe et Top 5 Moorsele Championnats d'Europe, présenté par" TOM OBEN"
A ces côtés son fils GIRLAN Bey, Médaille de Bronze , appartenant à Athbah Stud!